cross-country-hoppers... Cross Country Hoppers Square Dance Club Norderstedt e.V. Ihr Web-Server befindet sich in Norplex Communications (Nordrhein-westfalen, Duesseldorf.) ns.norplex-communications.com, und ns.norplex-communications.net sind ihre DNS Nameserver. 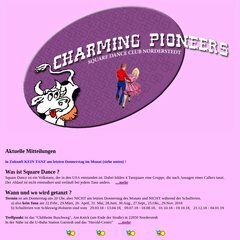 Die IP-Adresse des Servers der Webseite Charming-pioneers.de lautet 83.220.132.29.